How do I know if this article applies to me? If your funding tab looks like the screenshot below, then this article applies to you. If it does not, then you can disregard this article and see How To Set Up a Bank Account. If you are raising funds via direct credit card in USD, and have a US based bank account, funds are sent to you via Stripe, our credit card payment processor. Stripe will create an account for you where funds are collected, and then disbursed to your US bank account, up to 15 business days after the end of your campaign. This only applies if you have a US bank account. If your bank account is in any country other than the United States, please select the appropriate country, and do not select United States. Please note that the above listed fields cannot be changed after you go live with your campaign. What does "Legal name" mean? Stripe is going to eventually use this information to verify you, so please enter the name exactly as it appears with the Social Security Administration and IRS. We recommend against entering a nickname, multiple people's names, or an organization name in either of the Legal Name fields. What if I'm raising money for a friend, family member, or someone else.? 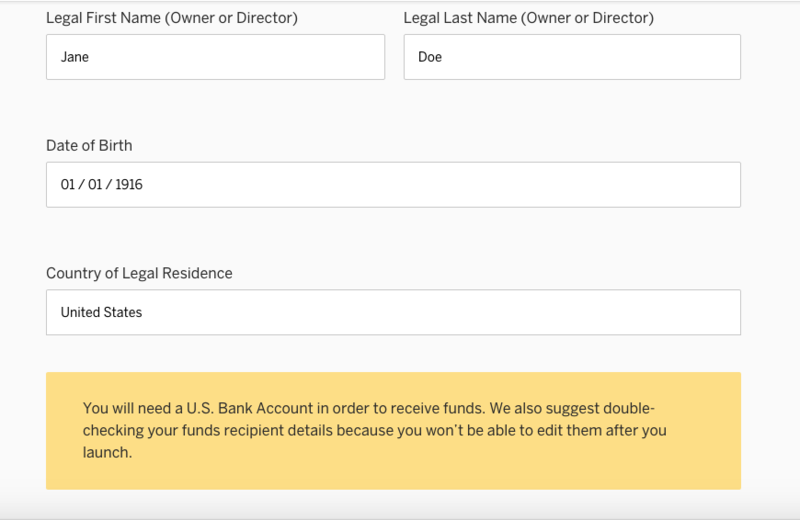 If you're raising funds on behalf of someone else, we recommend adding their legal name and date of birth to the Funds Recipient section. We also encourage you to add this person to your campaign team as an editor. This way, once you've started raising funds, they can log in and complete the form with their bank and identity information. I'm raising funds for a business. Whose information goes in the Legal Name field? If you're raising funds for a business or other organization, Stripe will still need to verify the representative of the funds. Please enter someone connected with the organization in these fields. Preferably this is the director, owner, etc., but could also be a treasurer or other member. Keep in mind this person will need to provide additional identity information once funds are raised. For more on this step, see our follow-up article here.